In addition to being used as a delicious filling for tacos, this mix can be used in an abundance of other ways, i.e. taco bar, hot bar, salad bar, pizza, nachos, potato hash, etc. A unique use of the “Super Mix.” You’ll get transported right back to your childhood with this powerful combination of super foods and messy deliciousness that is a sloppy joe. The Super Joe can be served on the hot bar, in the Chef’s Case, salad bar, as a sandwich and even at the burger bar. The Super Rizo mix packs a punch with guajillo chiles and spices to give it that essential chorizo flavor. It can be used in multiple ways to add a kick of extra flavor and protein to any dish, i.e. taco bar, hot bar, salad bar, pizza, nachos, breakfast hash, v’egg scramble, etc. Our Jalapeño & Cheddar Mac & Yease has the same creamy richness and nutrient dense profile as the traditional Mac with the added kick of fresh jalapeños and Good Planet Cheddar Cheese. The Jalapeño & Cheddar Mac & Yease is 100% vegan, dairy free and nut free. It can be served on the hot bar, Chef’s Case, as a pre-packed item and made to order for restaurant service. It’s a versatile item that can be eaten as a main dish, side dish or used to elevate other meals, i.e. Mac & Yease quesadilla, burrito, nachos, burger, etc. This recipe is based on Chef Ayindè’s great-grandmother Mary’s baked Mac and Cheese. A recipe that was passed down through the generations and veganized to accommodate today’s varied lifestyle choices. It’s a recipe built from tradition that all families can build a meal around. The versatility makes it perfect for young vegans, multi-vore families, and those who want to add a guilt free treat to their healthy lifestyle that still tastes like a piece of home. Mac & Yease is a great source of protein, uses local, non-GMO ingredients and is packed with the benefits of nutritional yeast. Nutritional yeast is a significant source of B-complex vitamins, iron, protein and provides all 9 essential amino acids to our bodies. We use local, non-GMO soy milk from SoyDairy in San Diego. Soy milk provides the highest protein value in a non-dairy milk while maintaining creaminess and richness. Mac & Yease is 100% vegan, dairy free and nut free. The Mach Tuna Salad is made with organic, non-GMO tempeh. Tempeh is a fermented soybean product with many probiotic benefits. It is one of the best sources of plant based proteins and is packed with probiotics, antioxidants and isoflavins that support better health. It is versatile, delicious and offers an impressive nutrient profile. The Mach Tuna Salad can be served on the salad bar, in the Chef’s Case, in the refrigerated section and as a made-to-order sandwich or wrap. Ayindé Howell is a restaurant trained chef of nearly 20 years and a life long vegan. I Eat Grass (iEG) came to be after children teased him thinking that grass was all he could eat growing up vegan. 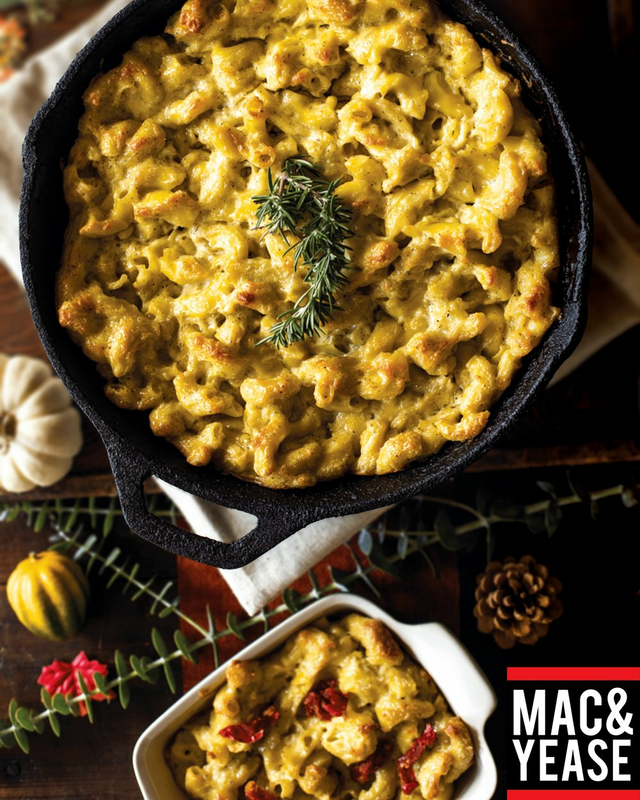 Chef Ayindé’s Original Mac & Yease gives you a healthier, creamy, full of flavor version of America’s favorite dish. Dairy production plays a large roll in greenhouse gas emissions, which are a factor of climate change. Emissions of greenhouse gases such as methane, nitrous oxide, and carbon dioxide are all produced by the dairy industry. According to the NDDIC some 30 million to 50 million Americans are lactose intolerant. Many people suffer from their lactose intolerance, still eating dairy filled meals and living with digestive discomfort. When you’re eating Mac and Yease, you are not only being kind to your digestive system, you are being kind to the earth as well.